Dimensions 0.25 by 6.75 by 10.25 in. Amazon.com description: Product Description: Thor is called upon to fulfill his father's legacy as lord and master of the Eternal Realm--leaving Earth' protection in the hands of the untested Tarene! But an old foe of the Thunder God has embarked on a quest for immortality, one that may spell the end of both Midgard's fledgling guardian and Thor's new reign! And then it's Thor, Lord of Asgard vs. Desak, Destroyer of Pantheons! 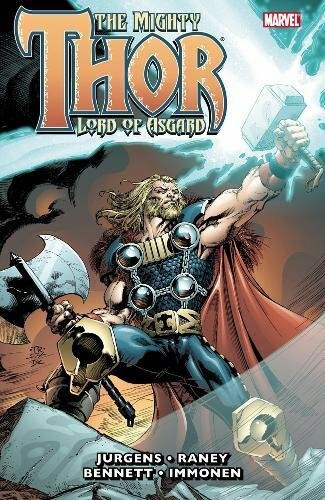 About: Thor is called upon to fulfill his father's legacy as lord and master of the Eternal Realm--leaving Earth' protection in the hands of the untested Tarene!